2003-06-07. New. Ships with Tracking Number! INTERNATIONAL WORLDWIDE Shipping available. Buy with confidence, excellent customer service! Walker Large Print, 1985-12-01. Paperback. Used:Good. 1985-01-09. Good. Ships with Tracking Number! INTERNATIONAL WORLDWIDE Shipping available. May not contain Access Codes or Supplements. May be ex-library. Shipping & Handling by region. Buy with confidence, excellent customer service! NORWALK, CONN.: THE C R GIBSON CO., 1962. Hardcover. Like New. pub by Gibson, 1962. hardcover book, fine, clean and tight. In original gift box, good with a few scratches on box. C.R.GIBSON. Hardcover. B001R9ASOG New Condition. . New. Bristol Park Books. Hardcover. 0884864944 New Condition. . New. Peggy Pinson. Hardcover. 076676656X New Condition. . New. Christian Large Print. PAPERBACK. 0802725023 New Condition. . New. C R Gibson Co. Hardcover. 0837817935 New Condition. . New. 2012-08-01. Good. Ships with Tracking Number! INTERNATIONAL WORLDWIDE Shipping available. May not contain Access Codes or Supplements. May be ex-library. Shipping & Handling by region. Buy with confidence, excellent customer service! C.R.GIBSON, 1962. C.R.GIBSON 1962 First Edition NAP Fine/ no dj, Bright pages. Gold boards with glossy gold lettering and design.. First Edition NAP. Hardcover. Fine. 2003-06-07. Good. Ships with Tracking Number! INTERNATIONAL WORLDWIDE Shipping available. May not contain Access Codes or Supplements. May be ex-library. Shipping & Handling by region. Buy with confidence, excellent customer service! Norwalk, Connecticut: C. R. Gibson Company, 1962. An inspirational collection of great thoughts and poems which will suit all occassions and all moods. 86 pp. Themes are: Love, Joy, Peace, Long Suffering, Gentleness, Goodness, Faith, Meekness, Temperance. Book slightly scuffed at tail of spine, ow book is as new. Laid in is complimentary book mark which descibes this book and advertises the companion volume, 'Wings of Silver'. Bookseller's Inventory # 133264. Presumed First Edition. Gilt Cloth. Fine/No Jacket. Illus. by Gordon Brown. 8 1/4" X 6". Norwalk, Conn.: C. R. Gibson Company. 1962. First Edition Thus; First Printing. Hardcover. Very Good in boards. Small crack to boards at fold from front panel to spine. ; 8vo 8" - 9" tall; All domestic orders shipped protected in a Box. .
Christian Large Print. PAPERBACK. 0802725023 Like New Condition. . Fine. C R Gibson Co. Hardcover. 0837817935 Like New Condition. . Fine. Bristol Park Books. Hardcover. 0884864944 Like New Condition. . Fine. C.R.GIBSON. Hardcover. B001R9ASOG Like New Condition. . Fine. Peggy Pinson. Hardcover. 076676656X Like New Condition. . Fine. C. R. Gibson Company, 1962. Hardcover. Like New. Vintage hardcover in excellent condition, issued without dust jacket, no writing, non-smoking home, clean text, binding tight., free delivery confirmation on all US orders, West Coast, APO, Hawaii, Alaska, Puerto Rico should opt for "expedited" shipping. Save a tree. Read, Recycle & Reuse. Buy all your used books from Enough Books. C .R. Gibson Company. Hardcover. B000LH8AE0 New book. in the box. . New. Bristol Park Books, 2012. Hardcover. New. 7.71 x 5.17 cm. Bristol Park Books, 2012-10-16. Hardcover. Used:Good. In Stock. Always but with confidence. C R Gibson Co, 1951-06-01. Hardcover. Used:Good. C R Gibson Co, 2000-03-01. Hardcover. Used:Good. Norwalk: The C.R. Gibson Company BOOK: Previous Owner Markings (Inscription Inked to Front Free Endpaper; Pages 3-5 Show Paperclip Rust Stains and Impressions to Upper Edge); Light Shelf Rub to Boards; Spine Slightly Cocked. DUST JACKET: Missing. A word fitly spoken is like apples of gold in pictures of silver.-Proverbs 25:11. CONTENTS: Love; Joy; Peace; Long suffering; Gentleness; Goodness; Faith; Meekness; Temperance.. Hard Cover. Very Good/No Jacket. 8vo - over 7¾" - 9¾" tall. Bristol Park Books. Hardcover. 0884864944 *BRAND NEW* Ships Same Day or Next! . New. Bristol Park Books. Hardcover. 0884864944 *LIKE NEW* Ships Same Day or Next! . Fine. G. R. Gibson, 1962. Hardcover. Poetry; Contents are about Love, joy, peace, long suffering, gentleness, goodness, faith meekness, temperance. (86 Pgs.) Golden boards. Owner's inscription on cover page. No DJ. BOOK NEAR VVG. Bristol Park Books. Hardcover. 0884864944 Special order direct from the distributor . New. 86 page padded gold metallic boards with embossed gold lettering. Book is in very good+ condition. Back cover has indent on padded area. Gift note on fly leaf. 6" x 8". Weight: 10 oz. A sprightly collection of hundreds of famous, amusing, serious, and inspirational sayings on such subjects as Love, Joy, Peace, Long Suffering, Gentleness, Goodness, and Faith. Jo Petty has spent over thirty years collecting these wonderful sayings. She is compiler of many inspirational books. 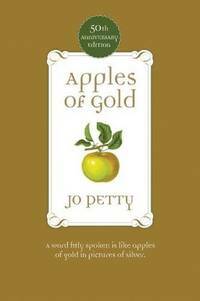 Apples of Gold is particularly treasured as a wonderful gift. Connecticut: C. R. Gibson Company, 1962. slight wear cover edges, minimal library marks, some staining page edges, otherwise book clean and tight. . First Edition. Hard Cover. Very Good/No Jacket. 8vo - over 7¾" - 9¾" tall. Ex Library. Bristol Park Books. Hardcover. 0884864944 . New. C.R. Gibson. Very Good with no dust jacket. 1962. Hardcover. vg,nj; B025519; 86 . Norwalk: C. R. Gibson Co.. Good in Good dust jacket. 1962. no stated edtion. Hardcover. 8vo 8" - 9" tall; 86 pages; Gold binding, previous gift note. Book solid clean and tight. Box clean with rubbed corners. .
Bristol Park Books. Hardcover. 0884864944 . . New. 2012.